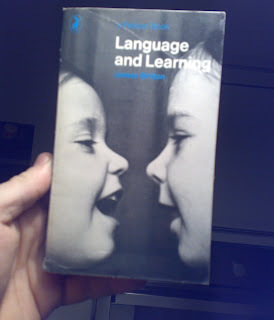 In terms of children's language acquisition and development, James Britton in 'Language and Learning', suggests that as they grow and their vocabulary and understanding increase, a fundamental change takes place. Namely, there is a shift from 'what is essentially play to what is essentially work'. This is marked by a change from the potential delight in (and of) things, with words used to describe them that 'stay close to' those things, towards a proper 'respect' for words which moves them away from the things they represent. The inference being here, that something is lost.